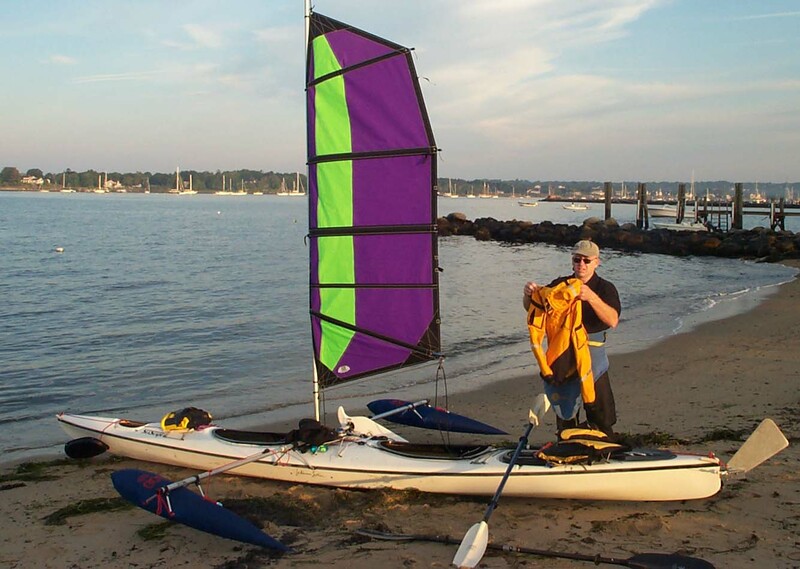 I was introduced to kayak sailing in 2002, when I and Mark Starr sailed a double kayak 100 nautical miles along the New England coast, from Stonington, Connecticut, clear across Rhode Island, through Vineyard Sound and Nantucket Sound, to Chatham, Massachusetts. (I’ve posted the story in a separate post.) It was a memorable trip. I was hooked! It took the best part of three years—because Mark Balogh was a perfectionist, did everything himself, and was overwhelmed with orders. He was notorious for absurdly late deliveries, which probably contributed to the fact that Balogh Sail Designs now has a new owner. assorted stainless steel and plastic fittings (Harken cam cleats, blocks, shackles) and lines. The prominent feature of the BSD BATWING™ is the hanglider inspired airfoil. 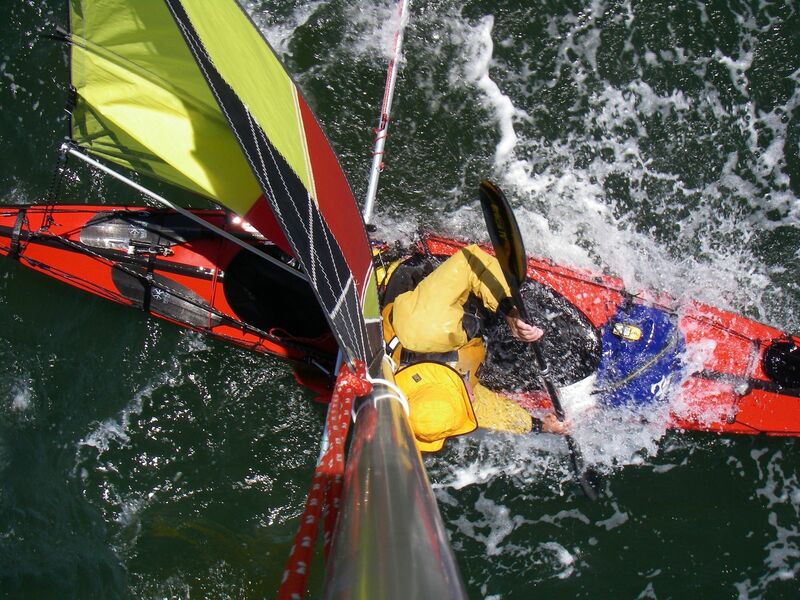 Inherently low parasitic and induced drag components are particularly appropriate rig characteristics for the limited stability of narrow, small sailing craft. The BATWING™’s efficiency and low center of effort provide superior performance on all points of sail. 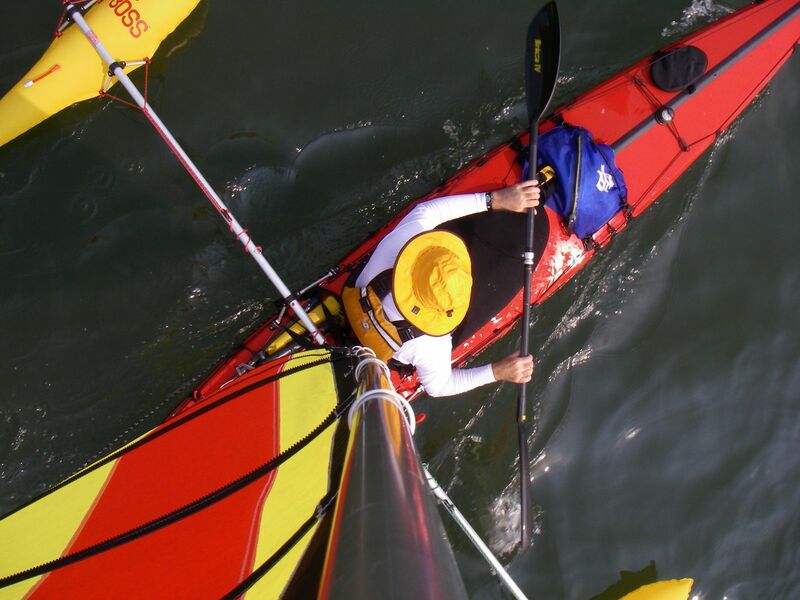 Using light weight aluminum tubes for the akas and modern laminates to make inflatable amas we invented the BOSS™ outrigger system especially for sailing kayaks. Among the challenges were to make a sturdy inflatable ama shape that could compete hydrodynamically with the long thin traditional ama shapes. During development, we came up with a design for mounting the amas to the akas that is completely unique and covered by two U.S. patents. The patents cover a method of mounting that allows automatic and manual adjustments of the ama to alter its hydrodynamic characteristics to suit specific conditions. In short, the suspension system allows the ama to adjust its shape in reaction to the water. we also felt that the ability to convert from a kayak to a sailing kayak and back, at any time, on the water or on the beach was absolutely critical if our boats were to maintain their function as kayaks. 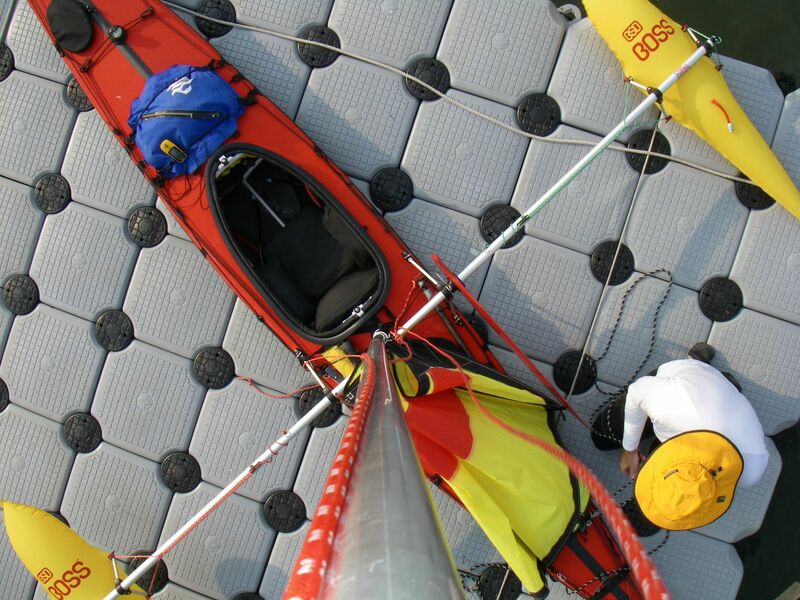 Indeed, as I have personally verified at least under calm conditions, apart from the cross-bar that is semi-permanently mounted, the entire rig—the akas, amas, mast, and sail—can be assembled and disassembled while on the water and stored either inside the kayak or at least on deck. The longest section of the rig is 47 inches long, the whole rig weighs 22 pounds, and it fits into a large canvas sail bag. A perfect complement for a folding kayak on its travels! There are always some tradeoffs in choosing a rig location. My personal feeling is that mounting the rig aft to gain paddle clearance is not the best strategy. The problem is that to gain real paddle clearance you have to move the rig further aft of the cockpit than might be best for sailing. To gain the paddle clearance you tend to sacrifice handling performance. [But that said,] I would say that for best sailing performance there is little difference between the forward and aft mounted rigs. If either is located for best sailing there will be paddle cross tube interference just on different ends of the stroke. My reason for choosing aft rig on my own boat would be that like the clear view forward and I think some boats may sail as well or better with an aft rig. The downside is that you really have to develop a good feel for sail trim and even with good technique, handling the halyard and downhaul can require more physical flexibility. Also boats with aft mounted rigs usually demand more from the rudder system. In the end, I decided on the aft mount, and I’ve been happy with it. As I expected, it interferes little with my paddle stroke, which is, or should be, a high-angle stroke far forward—indeed, when it does occur, the clatter of the paddle against the cross-bar behind me is a useful wake-up call (sometimes literally) that my form is slipping. With the aft mount, the view forward is unobstructed. 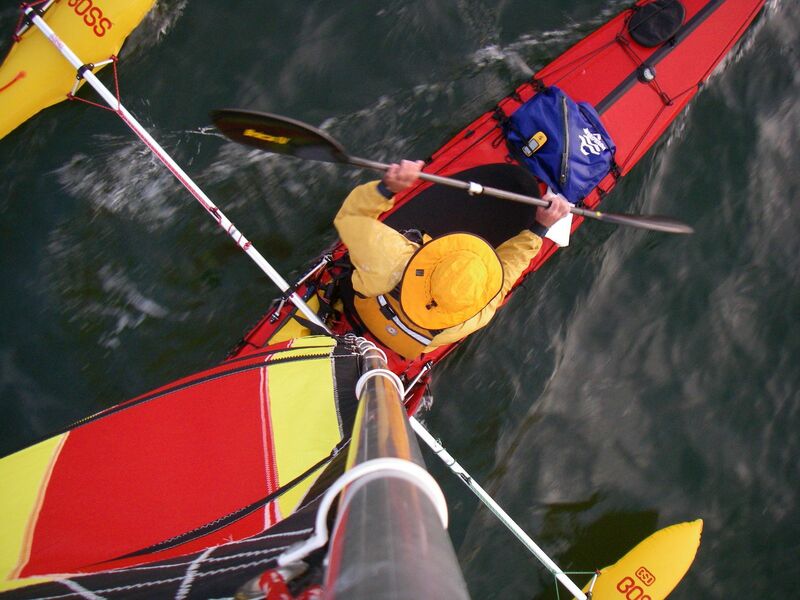 The aft mount avoids the awkwardness of having the mast, if mounted forward, between my legs and furthermore interfering with the loading of the bow of the kayak, which, given the small bow hatch of the Feathercraft K1, must be done through the cockpit. Against these advantages of the aft mount, there is the need to sail largely by feel. But I soon learned to do that, and for reefing and other more extensive adjustments to the rig it is easy, with the stability provided by the outriggers, to completely turn around in the cockpit (see photo below). The large rudder provides more than sufficient steering authority. From my base at Pier 40 on the West Side of Manhattan, I’ve sailed in all directions—north up the Hudson River, south into the Lower Bay of New York Harbor, and east into Long Island Sound. Here is a photo from 2007, from a series taken automatically every five minutes with a waterproof camera attached to the end of an aka. To beat the New York summer heat, this was a night sail, leaving Manhattan before sunset and returning before dawn. In an earlier post I’ve already posted a slideshow from another such sail that same summer; the individual photos are here. A memorable sail, in August 2007, was from Manhattan out into Western Long Island Sound and back, altogether 110 nautical miles in two days. For that trip I attached the camera to the top of the mast; the series of photos is here. The first day was uneventful: except in brief thunderstorms, the wind was weak and variable, and I paddled more than I sailed. But that night, as I slept on the beach at Lloyds Neck on the north shore of Long Island, a cold front came through. I woke up to an autumnally blue sky and a cold 20- to 25-knot wind out of the northwest. In front of me, Long Island Sound was covered in whitecaps. I pushed off the beach and set a course across the wind. Even with two reefs in the sail, the boat picked up speed and soon was streaking through the water at 10 to 12 knots, bouncing over the 3-foot waves. The next few hours were eventful. Second day, 3:40 p.m. The wind is moderating, so I am taking a reef out of the sail. Notice how, with the stability provided by the outriggers, I can climb out of the cockpit and turn completely around to attend to the rig. 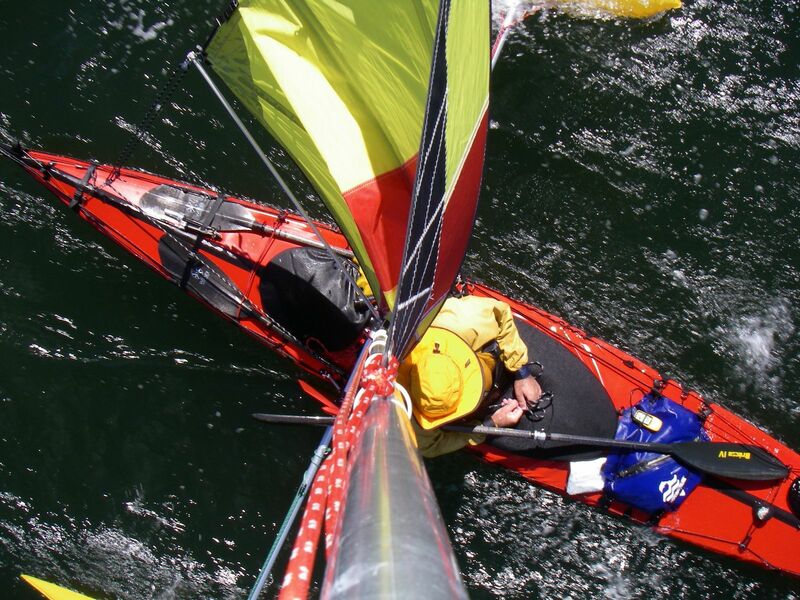 How does such a sailing kayak perform? Given steady wind of 10 knots or more, the boat just flies across the wind on a beam reach, its best point of sail. 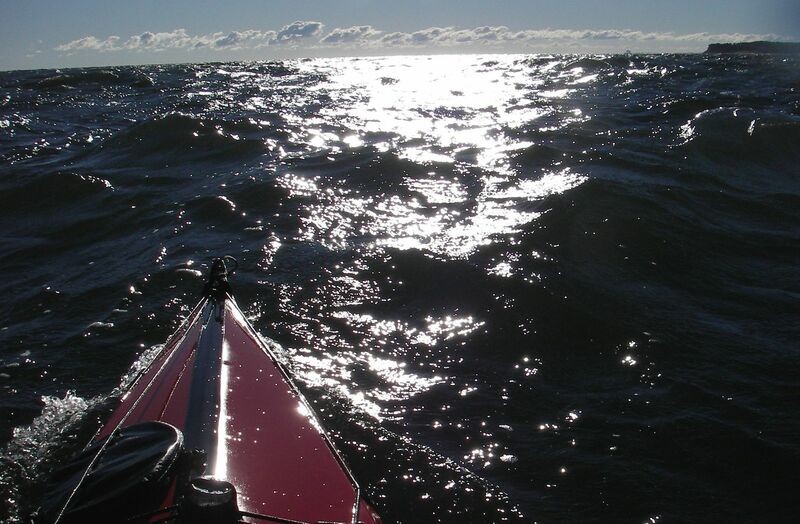 Of course, being so close to the water and waves exaggerates the sense of speed—that’s half the fun, getting a thrilling ride at speeds of just a few knots—but by my GPS I’ve attained speeds of 10-12 knots and more. Higher speeds still might be achieved with the same rig mounted on a slimmer kayak—the Feathercraft K1, 16.5 feet long and 25 inches wide, has a fineness ratio of only 7.9. Sailing upwind, performance is good, too. However, especially in light winds it can be difficult to sail less than about 50 degrees off the wind. Then I usually paddle as well. Paddling keeps the speed up and allows the boat to sail noticeably closer to the wind, presumably by increasing the apparent wind. A related problem is that coming about through the eye of the wind can be difficult to complete. 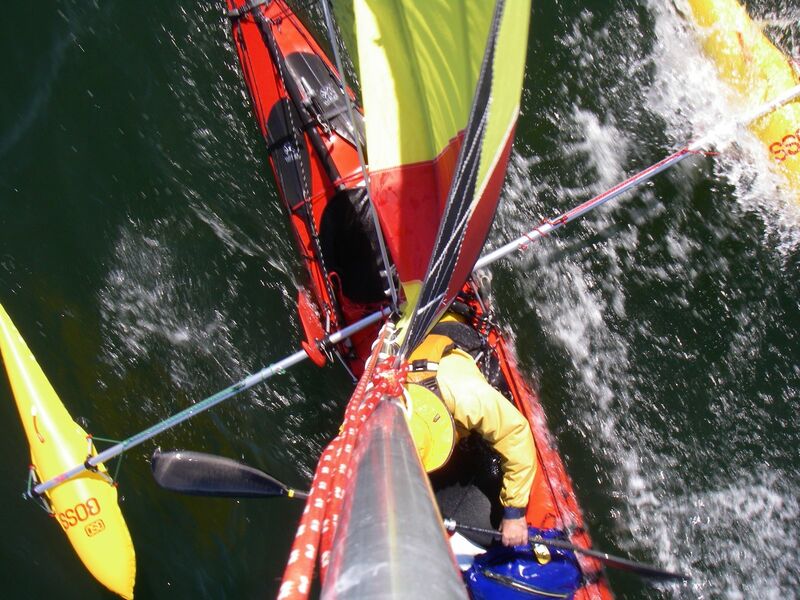 The boat does not have enough momentum to drag the downwind ama, which digs into the water, through the turn. I believe that this is a problem with light multihulls generally. Again, paddling helps complete the turn. Running downwind, especially in light winds, the boat can feel a bit sluggish. I get impatient and paddle under these circumstances too… A head sail of some kind might help. I notice that Feathercraft, which now also sells a rig much like Balogh’s (although less elegant in detail), offers a jib as well as a spinnaker. Balogh Sail Designs apparently does not. Sailing AND paddling. The top batten, which is short and stiff, often remains bent the wrong way after a tack without (minor) intervention. Notice also the bend of the mast. Clearly, sailing a kayak takes a lot of paddling :-) Fortunately, with the aft-mounted rig, I find that I can paddle the fully rigged boat almost as fast as I can the bare kayak. The handling characteristics are very different, however. With the widely spaced outriggers, the boat is massively stable. (At first I instinctively continued to try to lean the boat into waves; I soon learned that this was unnecessary and indeed ineffective.) I can take a nap, get out of the cockpit and turn around, stand up and stretch. 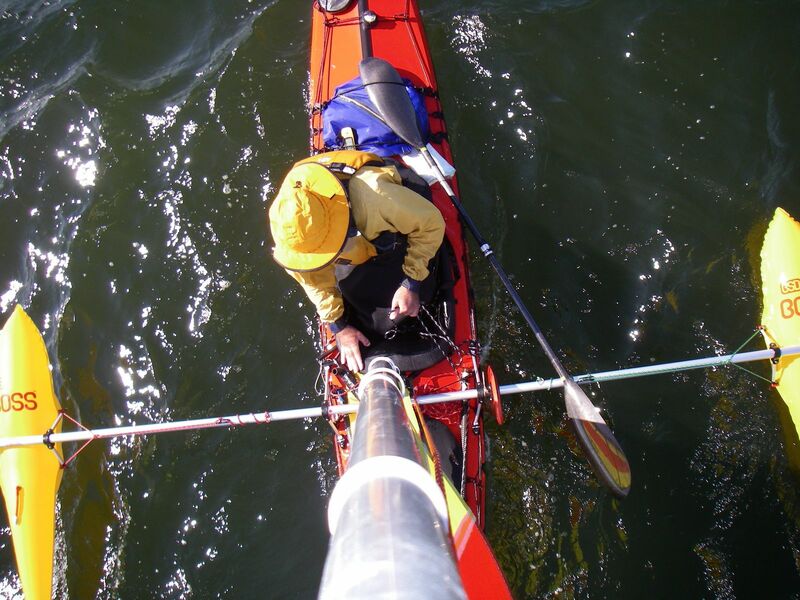 This opens up new possibilities for long kayak expeditions. It’s not that sailing is all that much faster. With weak, shifting, contrary winds, sailing might take just as long as paddling to a distant destination. But there is much to be said for knowing that your boat will carry on steadily whether you paddle or not, while you watch the sea, eat, sleep, keep warm—simply live, which at times may take all your energy—for days if need be. Since 2009, Balogh Sail Designs has been owned by David Valverde, who clearly has injected new energy into the company. 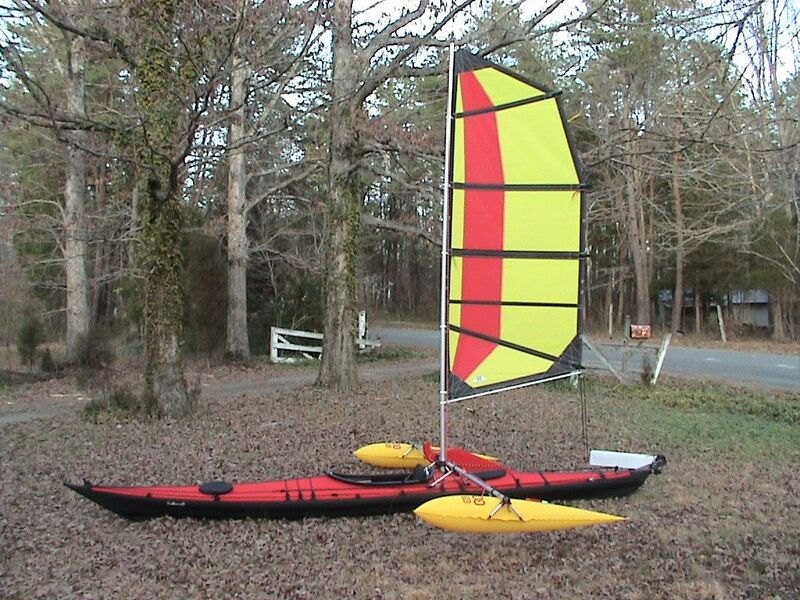 Various Batwing / BOSS rig configurations for folding kayaks, hardshell kayaks, and canoes are available, as well as several other sail types. Best of all, Balogh Sail Designs is now based in my neighborhood, on the Upper East Side of Manhattan. I’ll have to pay them a visit soon! 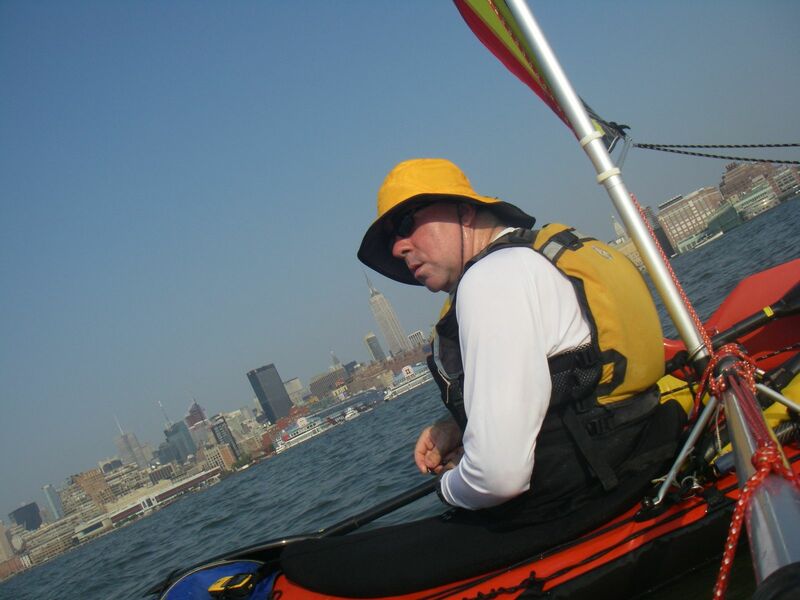 This entry was posted in Kayaking and tagged Balogh Sail Designs, Hudson River, Kayak Sailing, Kayaking, Long Island Sound, New York City, New York Harbor. Bookmark the permalink. Thanks, Tom—I am glad it was useful! Oh my gosh…I am thrilled that my local has ‘torchlight kayaking’ (kayaking at night in the bayou–we’re not leaving there any time soon), and now you show sail kayaking. I have very much to learn…. I too, own a Feathercraft K1, and have the exact same rig mounted; but I put my mast in the rear hatch. That necessitated a much bigger sailing-type rudder; which Dave Valverde helped me to build. This system is simply the FINEST sail rig out there ! If you are considering one, GO FOR IT ! You won’t be disappointed ! You get what you pay for, and these rigs are the finest made ! Unfortunately Vlad is no longer with us (and sadly, the same is true for Feathercraft). I’m posting your comment so others can see, and perhaps learn. But Vlad no longer needs kayak sails, alas…. So sorry to hear of that. As to Feathercraft, yes, Doug Simpson closed his doors. But he still maintains a small shop in BC, Canada. A limited selection of parts can still be purchased from him, and he can manufacture certain items as well. But no repairs or modifications are available anymore. Direct any inquiries to info@feathercraft.com…. Well, that’s good news for Feathercraft afficionados! Thanks for the update!